Bethesda has revealed the first gameplay video for Rage 2, showing off the game’s mix of true open world, guns, cars, mutants, and lethal boomerangs – along with a few new details. Here’s everything we know about Rage 2! 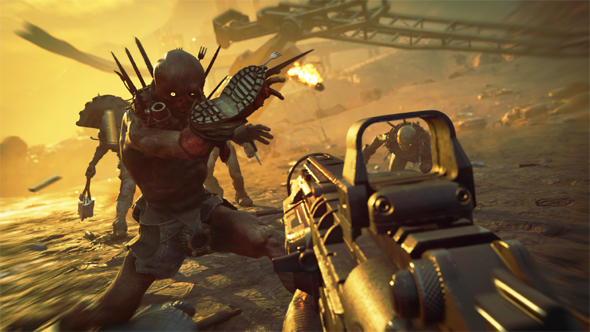 Unlike the first game, Rage 2 boasts a full open world wasteland for players to traverse. The trailer shows numerous returning features from the first game, such as the mutants, the Mad Max-like gangs, the cars, the ‘Mutant Bash’ TV show, and of course the deadly Wingstick boomerang things. Contrary to what we reported yesterday, apparently Just Cause creators Avalanche will not be the only team on Rage 2 – instead it will be a collaboration between Avalanche and original developers id Software. According to the press release, id Software will be handling the FPS gameplay and Avalanche the open world exploration – which seems a perfect mix to us. Avalanche were, of course, also responsible for the Mad Max game, so they’ve got experience in the area of open world wasteland-driving-insanity. We’re not sure whether Rage 2 will continue the storyline from the first game, but it does seem to have a similar setup. After an asteroid turns the Earth into a hellscape vicious gangs, mutants, and the tyrannical Authority vie for control. Players will take control of a new character called Walker, “the last Ranger of the wasteland”, as he fights against the Authority. The press release adds “you’ll have to rage for justice and freedom”. Not sure ‘rage’ is a verb Bethesda, but we’ll take it. Don’t expect to be playing Rage 2 this year however, as Bethesda have confirmed that it will be out in 2019. They’ll be showing off more of the game at their E3 conference on Sunday, June 10 at 18:30 PDT.